Next weekend, we will load our tribe of tiny people into the car, hitch up the camper trailer and point the car north, in pursuit of adventure and warmer climes. We will spend four weeks on the road, covering 8500km over 5 states. As you can imagine, there is more than a little bit of organisation and planning involved in getting us out the door and on the road. It’s not fancy, our travel binder. I have (had?) plans to create some beautiful artwork to slip in the outside pockets, but I put it off thinking I had plenty of time, and now here we are less than two weeks out and there is no more time. Same thing happened with the dividers. 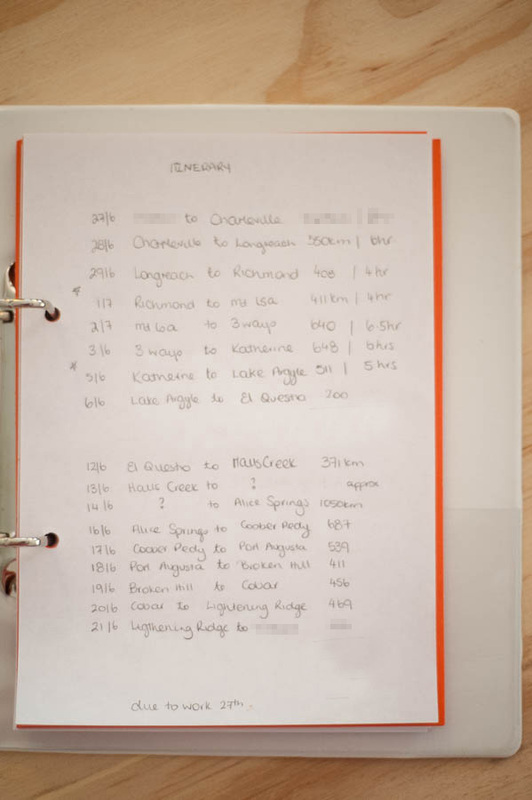 Inside the binder, our itinerary sits right at the front. Behind that is a section for our future trips – a section we can list and brainstorm until we are at a point to move a trip from future to currently-planning. Section two is our packing lists – one per person, one for entertainment, one for the main trailer, one for the drawbar storage. Section three is where the current trip info starts (more on the logic behind this later). In this section are our logistics worksheets. Each stopover has its own sheet, with dates and number of nights, campground including address, phone number and franchise chain (for loyalty discount purposes), and details of the total cost and deposit paid. The bottom half of the page is for details of attractions we want to visit, bookings and deposits. Section four is for maps – over the next week, I will start printing maps with each day’s travel on a separate page. Behind the maps, section five is the archive section. With current trip info in sections three and four, I can’t simply remove the dividers when I get home and quickly shift Current Trip into Archived Trips. The front of the binder has a clear pocket for storage, where I will tuck our caravan park loyalty cards. I also will slip some post it notes in there so I can easily mark current maps/logistics worksheets. A pen, a pacer and we are set. We used a similar system on our 2013 trip, though in a notepad rather than a binder, so I am confident this system will fit us perfectly. For now, I am simply using A5 printer paper, but do intend to make up something pretty in Illustrator. Likely when we get home (see above comment re time and my lack thereof!). For now it is on paper and that’s all we need. 3. I have some pretty sticker things for sections, want me to post you some? 1. Come meet us at Charleville or Longreach!! 2. This is Bear’s list. Beetle’s undie counts starts with a 2, and is well into double digits, never fear! 3. *mwah* ain’t you just the bestest? Only if you have something spare?